Gardening may be one of America's favorite hobbies, but it's not without its downsides. Can you imagine investing dozens of hours and hundreds of dollars redecorating your bedroom, only to have it crumble into ashes after a year? That is how it feels to start a new garden that withers away after a season. Not all plants are created equal. By choosing ultra vigorous plants that tolerate a wide range of growing conditions, you can be assured that your investment of time and money will continue to bring you pleasure for many growing seasons to come. In neighborhoods with new construction, the topsoil is stripped away, and the rubble that's left behind hardly qualifies as soil. What to plant in such a harsh environment? Start with a tough-as-nails perennial that features a cloud of sky blue flowers for three months in its first season. 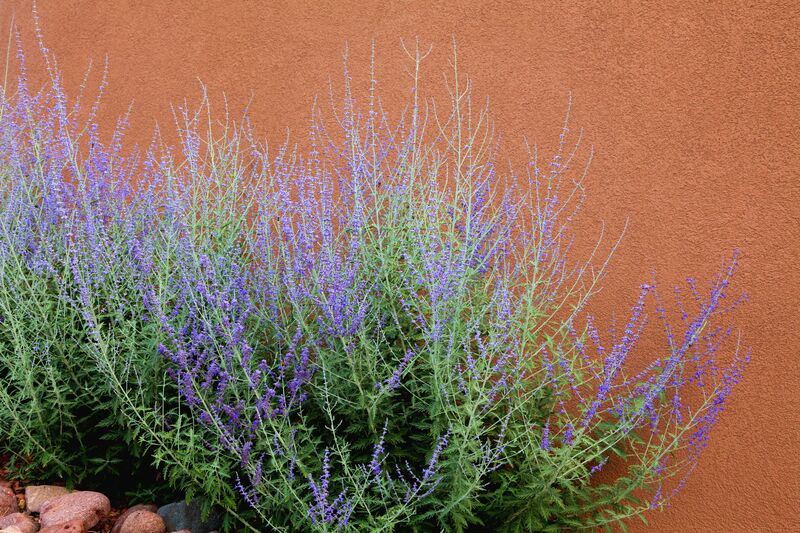 The one feature Russian sage can't live without is full sun, essential for healthy bloom production. The daffodil is one of those plants that you can casually scatter here and there in the landscape, and then look like a garden genius forever after each spring as your flowers multiply. Plant them deeply in the fall to ensure many seasons of returns; at least four inches beneath the soil's surface. A splash of bulb fertilizer is fine for pampered bulbs but not really necessary for peak performance. Space them several inches apart to allow for the colonies to have room to grow over the years. Don't let the soft, tumbling foliage of Lamium fool you: neither shade nor drought slows this blooming ground cover down. Variegated or silver leaves emerge early in the spring, and snapdragon-like purple or white blooms soon follow. Dead nettle plants spread quickly by shallow-rooted runners, but you can pull up extras and use them as accents spilling over the edges of your containers and window boxes. More than just a mere herb for the cat to frolic in, Nepeta x faassenii gained permanent cult status when the variety 'Walker's Low' was named as the 2007 Perennial Plant of the Year. Lovely grayish-green foliage complements the informal border, and bees delight in the nectar-rich violet blooms that appear throughout the summer months. Plants grow about two feet tall but have a prostrate habit that looks attractive at the edge of a wall or path. 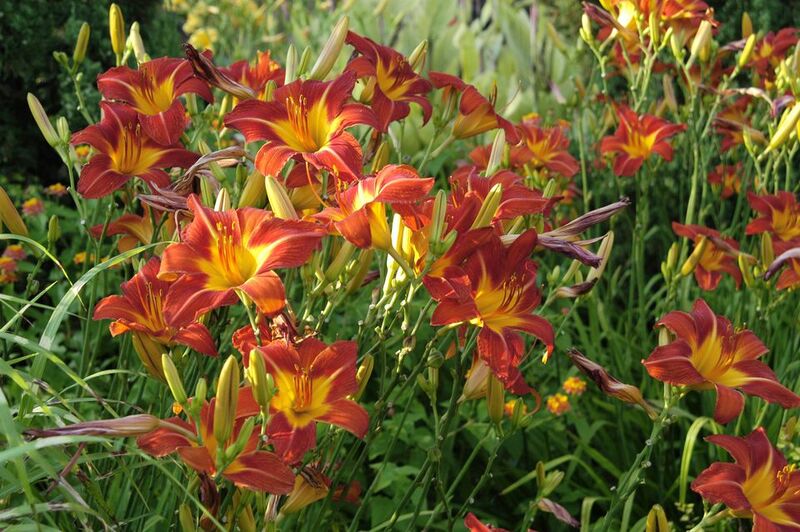 Stella D' Oro daylilies have become an office park landscaping staple, but daylilies have much more to offer than the popular gold everblooming variety. Although the color spectrum is limited to the warmer side of the color wheel, interesting color patterns and flower forms take the available cultivar number into the thousands. Full sun is best, although darker varieties may benefit from afternoon shade to prevent sunscald. Fertilization isn't necessary, but an occasional deep watering during summer dry spells is beneficial. Ornamental grasses belong on every lazy gardener's wish list. Many of them originate from the prairie and are used to surviving a range of pests and weather conditions. The deep roots of feather reed grass make it adaptable to wet and dry soils, and it grows just fine in lean soils, requiring no fertilizer. The six-foot blooming stalks make a handsome vertical accent that endures well into fall. Sometimes tough plants have a reputation for being invasive, but drought tolerant sedum plants always mind their manners. Also called stonecrop, this plant can survive for years without any watering, dividing, mulching, or deadheading. The varied genus offers tall and creeping varieties, all with succulent leaves that shrug off insects. Start with the wildly popular 'Autumn Joy' variety, which produces nectar-rich pink flower clusters at the end of summer. Gardeners who make room for a Buddleia in the landscape will soon discover that it's a one-stop buffet for many species of butterflies. The long flower panicles are comprised of many individual blooms, each with a rich store of nectar, which is why you will observe happy butterflies lingering over and around the shrub for long periods on warm, sunny days. Flowering happens on new wood, so frigid zone 5 winters have no effect on the summer show. Plant butterfly bush in full sun in average soil, and cut plants back in early spring to encourage healthy branching. Baptisia plants produce those sky blue blooms that complete any garden design, without the fussiness that many blue flowers exhibit. Plant false indigo in the rocky rubble of a new home construction site, and it will do just fine. Available in white, yellow, and purple hues, false indigo plants produce their blooming spires in the spring at the same time as peonies and bleeding heart. Butterflies love the low maintenance plants, but rabbits don't. Gardeners who wish to grow plants under a tree must contend with shade, dry soil, and competition for nutrients. Lady's mantle is one tough plant that can handle this environment. An exceptionally hardy plant, lady's mantle will survive zone 3 winters. Chartreuse flowers that appear in June are a lovely foil for blue and purple blossoms. Plants often self-seed prolifically, which you can allow to expand your collection or prevent with a few minutes of deadheading after blooming. Stachys byzantina is a plant for the fifth sense in the garden, as it is a tactile plant like few others. More than just fuzzy, the silvery leaves are downright woolly and hold up to stroking more than a silky flower petal would. The lavender spikes don't look like much, but bees love them. Lamb's ear plants grow in full to partial sun and are drought tolerant. The clumps that spread moderately each year provide pass along plants to friends, or you can dig some up to add to your container plants.